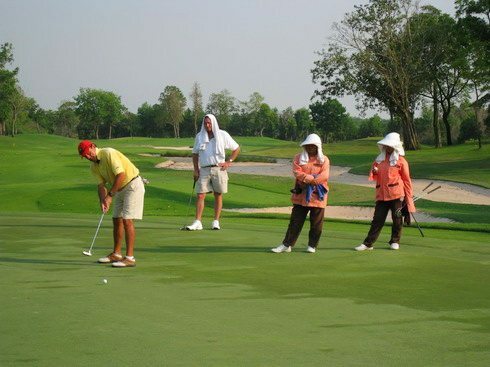 Lam Luk Ka Country Club sets the stage for a golf experience not easily forgotten. Lam Luk Ka has two 18-hole courses; the East and West courses. These 36 holes meander through Bangkok's wetlands, where shade trees and water ways provide homes for birds and wildlife and a relaxing day in a park land environment. The Championship East Course played host to the 2002 Thailand PGA Championship and 2009 Asian Tour qualifying events. The Lam Luk Ka East Course will challenge the best players, but make for an enjoyable round if played from the somewhat friendlier white tees. The West Course is relatively short, at 6,605 yards, but water comes into play on 15 holes making course management a key factor in scoring. The West Course is a favourite of tourists, recreational golfers, including myself. Unusually, it is actually feasible to play a combination of these two courses, making each visit to the club a unique experience. Most of the time I prefer to play golf at Lam Luk Ka in the afternoon. This ensures quieter fairways as Lam Luk Ka gets little play after 12:00. Watching the sunset on the back nine is a great way to finish any day, no less one that includes a good round of golf. The course is kept in fabulous condition from tee to green. However, green reading can be tricky and it is best left to one of the friendly and experienced caddies. Some of the most memorable holes on the West Course include the par-3 eighth. A large water hazard short and right of the green punished errant tee shots with a slide fade. This applies to me most of the time! Number 13, lucky for some and unlucky for others, is perhaps the best par-5 on the West Course. The key is to hit the fairway with your tee shot, because water guards the entire left side of the hole, and anything right forces you to aim at the water for your lay-up. It is a difficult approach shot with mounding guarding the front right of the green and water and bunkering guarding the left. A par is a good score here. To complete the round the 18th is a long a 415 yard par-4. I often play conservative and hit a 3-wood off the tee. Too long goes through the fairway, or worse into the water. The second shot is a layup up short of the creek that bisects the fairway. Hopefully good strategy is rewarded with an easy chip and one put to save par. The club house although not modern, does have large lockers and an excellent restaurant with reasonably priced Thai food. Thai Country Club and Alpine Golf Club normally rate as the top Bangkok golf courses, but I would add Lam Luk Ka as a contender, especially if you enjoy a relatively unknown, but nevertheless good golf course in a countryside setting as a top priority.